Track Environmental, Social and Governance (ESG) related actions, news and disclosure of top listed and Indian businesses. Sustainability disclosure and reporting in India has received a fillip in the last couple of years. It has been driven to large extent by investors and policy makers. The Sustainability Leadership Forum has been working closely with businesses, investors, catalyst organizations and policy makers to identify the link between investment/capital flows and Environmental and Social (E&S) disclosure in India and have an integrated conversation about the expectations, concerns, challenges and realities surrounding ESG measurement/ management/ disclosure in the Indian market. Enhanced ESG disclosure communicated appropriately provides an opportunity to listed companies to attract investors with long-term perspective by enhancing and communicating about their ESG performance. Developing an ESG Information Enabler by constructing an ESG guide for investors on how they can get and use ESG information. Building on the work of the Working Group during 2013 and 2014, the outlook for 2015-16 is to leverage the research and information so far into greater action. 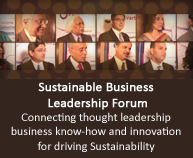 Facilitated by SBLF, cKinetics convened a sustainability disclosure and reporting working group in 2013 in partnership with the Indian Institute of Corporate Affairs, GIZ, and Impact Investing Policy Collaborative. The aim was to create a group which will identify institutional and policy linkages to drive Environmental and Social (E&S) disclosure. What are steps needed to coordinate actions between existing institutions to increase the prevalence of impact disclosure from businesses in India? When, where, and how should these steps be undertaken to promote deployment of investment capital looking beyond a pure financial return? The work aligns with the ongoing consultations of the IICA regarding the National Voluntary Guidelines on Social, Environmental & Economic Responsibilities of Business (NVG-SEE). How are the supply chains currently engaged on ESG issues? How are firms managing supply chain risk on ESG issues? How can businesses in these supply chains increase disclosure/ transparency on sustainability issues? Investor interest in standardized ESG data - What E&S metrics are requested by investors and insurers? This first of its kind report presents the landscape of preparedness of Indian businesses and their supply chain to adopt ESG management systems and disclose the actions undertaken by them, their drivers and risk perception. It also presents the investor perspective on gaining ESG information from businesses and steps needed to increase the prevalence of impact disclosure in India. The report examines the development of the National Voluntary Guidelines on Social, Environmental & Economic Responsibilities of Business (NVGs), lessons learnt for future policy makers and leveraging existing institutions. It also tries to establish the connect between NVG and the London Principles. The report presents the key findings of a survey amongst Indian businesses which examined how ESG measurement, management, and disclosure improves business operations, reduces risk and enhances access to capital. This interim research report presents an overview of the existing research related to ESG management, performance and actions by businesses and delves on, the drivers and challenges faced by businesses. It also maps the existing institutions driving ESG management and disclosure globally and in India. To learn more about the ongoing work, please contact Sustainability Outlook (Info@SustainabilityOutlook.in) with the subject ES Working Group.